You may have read about my previous attempts with smoked beer-can chicken … one of the tastiest and coolest-to-adapt and insane-leftover-making smoker dishes out there. I have switched it up several times, trying it with different types of beverages and liquids inside the beer can, and changing up the seasonings I put on the outside. 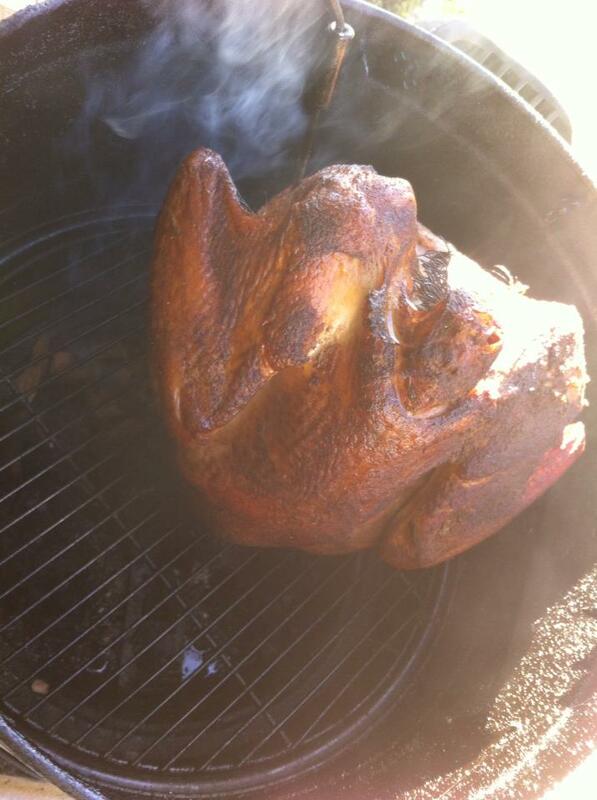 This year I wanted to try the same procedure with smoking my Thanksgiving turkey, and it worked out beautifully. It’s really a super-simple procedure: oil and season your bird on the outside, and stuff it with a beer can for the smoking process. Cook it to 160 internal temp, and you’re done. The hands-on time that you have to actually spend doing things is maybe 10 minutes. Since I have done this a few times, I wanted to offer some tips before I get to the specifics. Get a good digital thermometer. My smoker is vertical, so every time I lift the lid to take the meat’s temperature, some of the precious, sweet, sweet smoke escapes, and flavors the air instead of my dinner. I don’t like it when that happens. I invested in a good digital thermometer that tells me both the meat temperature AND the oven/inside of the smoker temperature. It even has an alarm so it will let me know if my smoker gets too hot or when my meat is finished. This is the one I have and it has served me well. Experiment with different seasonings. I use a Misto, which I can fill with extra-virgin olive oil and spritz the outside of the chicken or turkey, then I sprinkle it with seasoning. Since most of the flavoring is from the wood smoke, you can literally coat your bird in salt and pepper and it will be awesome (I like to use a pre-made Cajun seasoning — I am a huge fan of the Cajun Power company). But use what you like. Experiment with different types of wood chips with different types of meat. 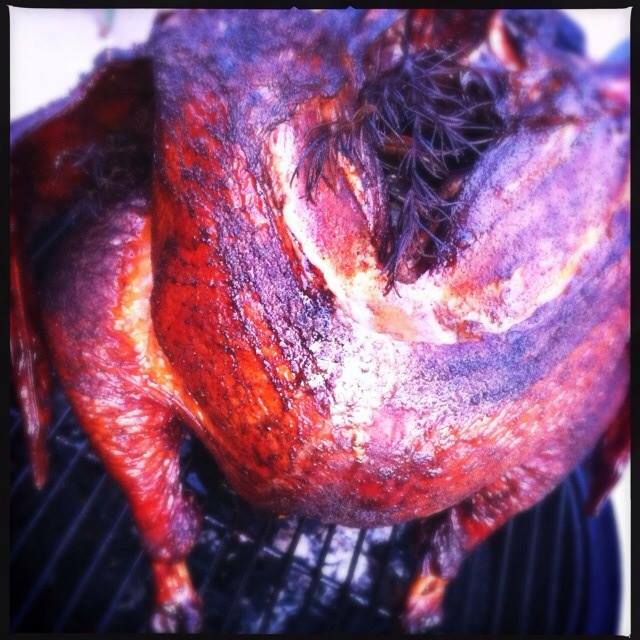 For this turkey, I used hickory wood chips, but I also really love mesquite wood chips for smoking poultry. 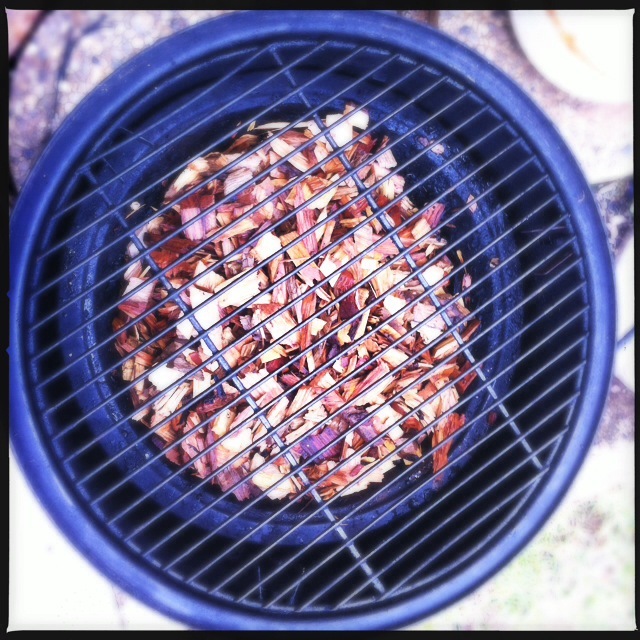 Soaked hickory chips on the smoker. Clean and trim the turkey (I had to cut off a bit of the fatty part by the neck, etc.). Spritz the outside of the turkey with a light layer of oil, then sprinkle your favorite seasoning blend over the skin (I like a Cajun seasoning mix). 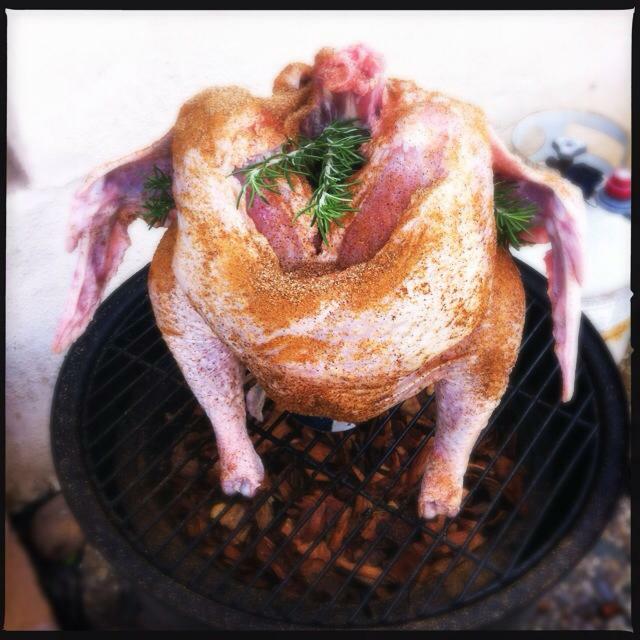 Situate the beer can inside of the turkey. Since turkeys are generally much bigger than chickens, I used a larger beer can. I also, just to avoid wasting beer, poured most of the beer from the can out into a cup, then when the bird was situated on the smoker (and didn’t look too wobbly), I poured the beer back into the can through the top of the bird. 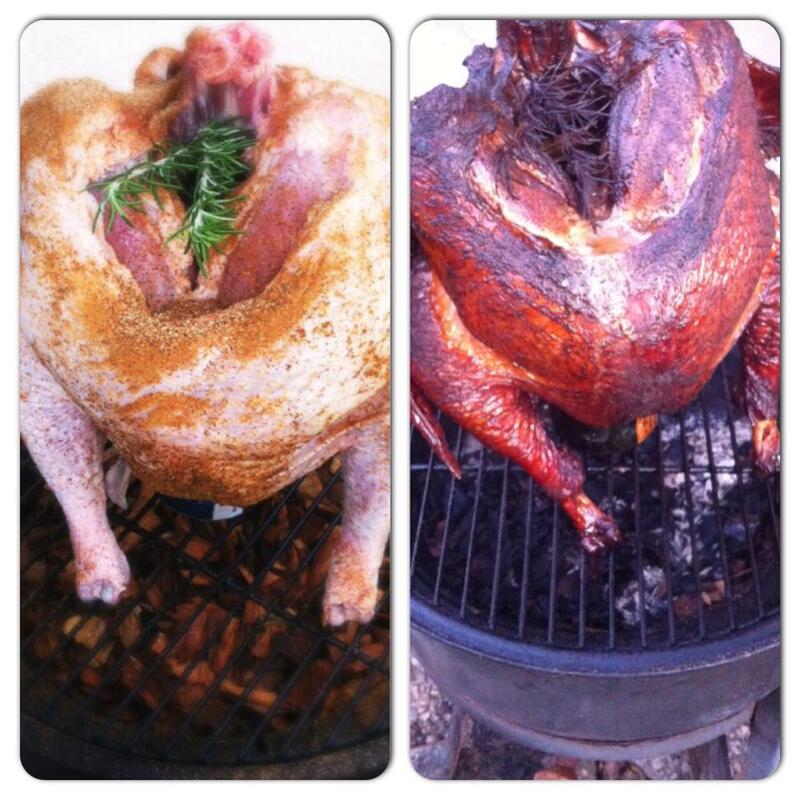 Depending on the size of your turkey and the dimensions of your smoker, you may have to maneuver a bit to get the beer can in there and get the turkey legs around it so the turkey is literally sitting on the can. You want to be able to look down into the neck cavity and see the top of the can. Smoke until the internal temperature is 160 degrees. For a chicken that is 5-6 lbs., that takes about 3 hours. 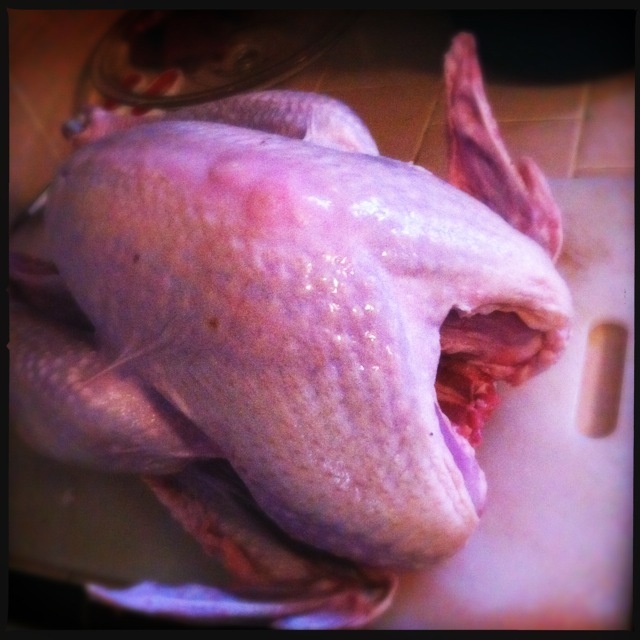 For a turkey that weighs about 11 lbs., it took six hours. Temperature is more important than time, and depending on your smoker, it might take considerably less time … or for that matter, considerably more time. Also when the turkey is done, the smoking process leaves it with a pink-colored smoke ring, and sometimes people can confuse pinkness with doneness. Just make sure the temperature is high enough and you should be fine. 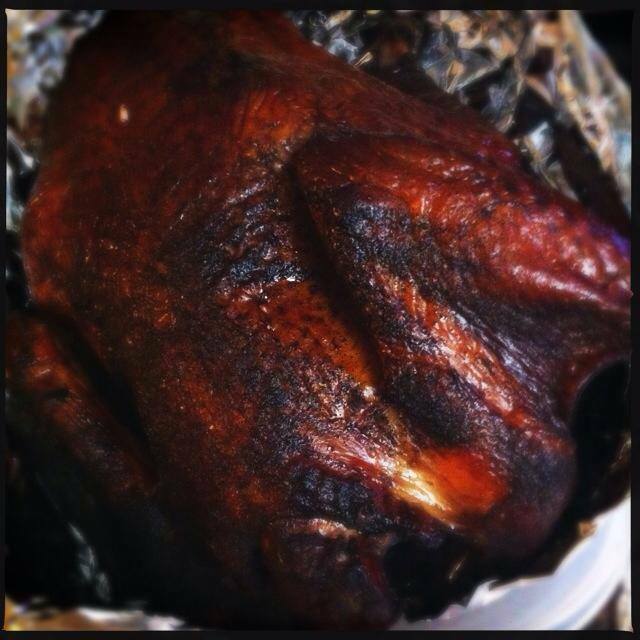 Fully-cooked smoked turkey … look at that color! Don’t forget to save those insides! So, every turkey you buy in the store comes with that little packet inside, that has the turkey’s heart, gizzard, liver, and usually also the neck bone. It’s Thanksgiving tradition in my house to (obviously) remove these from the turkey before roasting (or, in this case, smoking), and putting the offal either in a pot on the back of the stove and out of the way of all the other Thanksgiving dishes, or in the slow cooker, and making a big pot of turkey and rice soup. 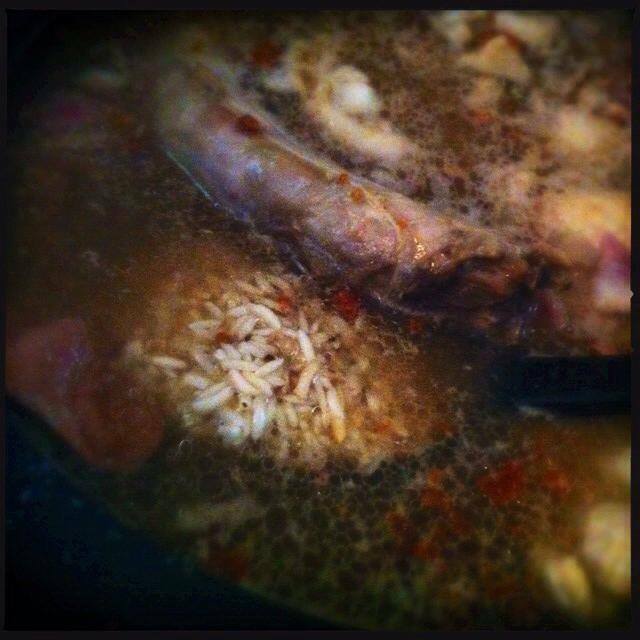 One would think that a huge pot of soup would be kind of superfluous given the huge bounty of food going around on T-Day, but you’d be surprised! After the initial meal, then the dessert, then the subsequent football game/ food coma, you might want to eat a little bit more, but not like, a full meal again … and then, this soup is perfect. You can also use the liver (plus a few more chicken livers) to make an insanely delicious pate for your Thanksgiving appetizers. Toss the livers on the smoker for a while (they will probably take less than an hour) and try this smoked chicken liver pate recipe. To. Die. For. 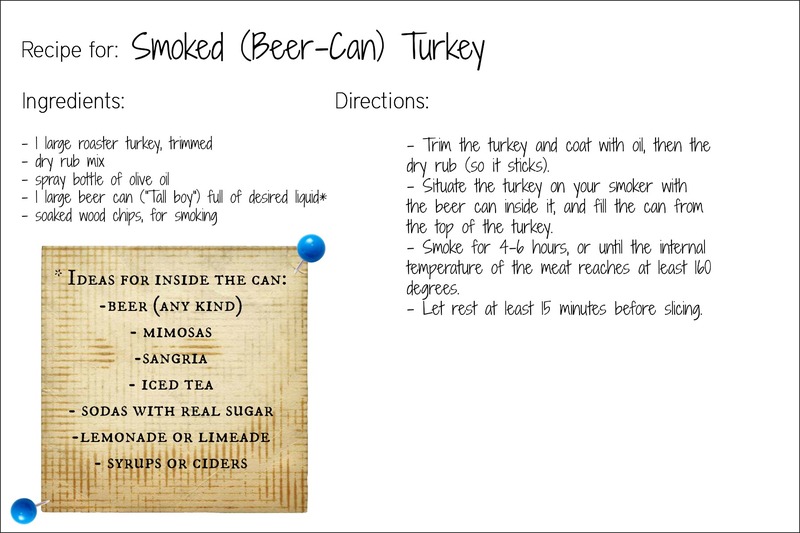 This entry was posted in cooking, food, holidays, leftovers, Thanksgiving, Uncategorized and tagged beer-can smoked chicken, beer-can smoked turkey, beer-can smoking tips, beer-can turkey, smoked pate, smoked turkey, Thanksgiving, turkey rice soup. Bookmark the permalink.